Home » Copycat Restaurant Recipes » La Madeleine Strawberries Romanov – strawberries served with a wonderful brandy sauce. La Madeleine Strawberries Romanov – strawberries served with a wonderful brandy sauce. This is my personal most ordered menu item at La Madeleine, these are easy to make, and they do make an elegant dessert. Looking for a great way to serve up fresh strawberries? This dessert is an elegant and easy dessert to prepare. This recipe is gluten free, and most guests will just love this. You can make this ahead of time, and serve whenever you like. You can't beat these strawberries served with a wonderful brandy sauce. Wash strawberries, and cut the tops off. Let strawberries drain. Mix together heavy whipping cream, powdered sugar, and the brandy. Beat with a mixer until this becomes thick. 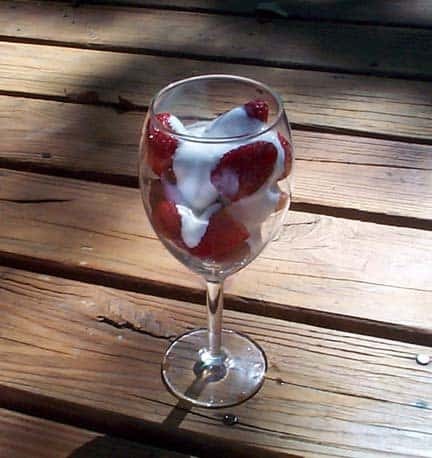 Place strawberries into glasses and spoon over the sauce. We made this for the weekend but there were children present so we use Mexican Vanilla in place of the brandy Major hit! I would love to have La Madeline’s Kale and Quinoa salad tecipe! This was great. I made it for a brunch!